The new iPhone 6 and iPhone 6 Plus aren’t the only big news stories that Apple broke in their announcement last Tuesday. The company also introduced Apple Pay: the new one-touch way to pay with your phone’s Touch ID. No opening apps or flipping through cards- Paying made simple. Does the new Apple Pay mark the death of the wallet? Buzzfeed and The Today Show seem to think so, at least in the sense of the “traditional” wallet we used to have crammed into our pockets and purses. 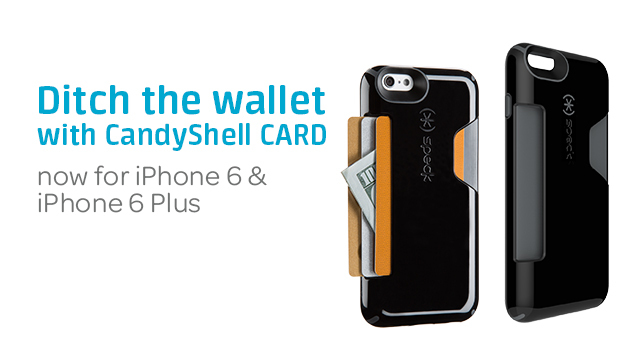 Intro the new way to carry less, while packing in more: CandyShell Card for iPhone 6 and iPhone 6 Plus. You’ve got Apple Pay to cover all of your expenses, but everyone still needs a iPhone 6 wallet case with a handy side-slot to bring your I.D., train or bus pass, and of course, a couple folded bills for your favorite cash-only corner stores.